We are all familiar with the romantic concept of “the one who got away,” right? Can any of you relate to a similar concept with a friend? Maybe you thought you had great spark with someone you met at the park, but never had the guts to ask her for her number? Maybe you had a great work friendship that you felt had potential to expand beyond the office but you never made the effort before it was too late? Maybe you had a best friend in high school that didn’t last the distance but that you regret losing touch with? 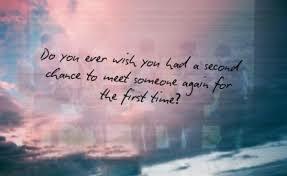 Maybe you had a great close friendship with someone that ended or faded away and you regret letting them go? I do. Maybe this is more accurate?! If you can relate to any of this, then this post is for you…. But mostly this post is for my friend. The one who got away. I have no way of knowing if you still read these posts, but in my heart I feel that you do. I hope so anyways. You know who you are, I don’t need to go into detail about what happened between us…. Or even what didn’t happen between us. Not that either of us really know what exactly happened. Sigh. What I will say is, the reason I know that you know this post is for you, is because we always spoke the same language. You always heard what I didn’t say, understood what I meant even when I couldn’t articulate it, and could predict my feelings about most things because you could relate. It is so rare to meet people like you, I felt like we were soul sisters in some way. I so enjoyed and looked forward to our endless conversations about everything and nothing. My phone, and my life, are so quiet without you. I miss you. Our little code words for things, our in jokes and the complete trust, understanding and general lack of judgement that existed between us. I am so happy I met you, if only to know that other people like you and I exist, and I am not as isolated as I often feel, being so different to most people I meet. I guess this is kinda sad, but I still have those conversations with you in my mind, because so many things remind me of you. Although these things make me miss you, they still make me smile. Sometimes I am so angry with you for walking away, because I didn’t deserve it, but mostly I am angry with myself for letting you go. I understand why you had to go. Because we are so similar, I probably would have done the same thing under the circumstances. I know you were in such a difficult position and I am so sorry that you found yourself there. I never wanted that to happen. I never imagined things would play out this way between us, or that you’d leave my life as suddenly and quickly as you had entered into it. I know you are still confused by what exactly happened. One minute everything was fine, and the next it was over, you had to let me go, although you couldn’t articulate why, exactly. I heard you. At least you tried and I appreciated that. A bittersweet painful goodbye. I have tried to understand your position and have compassion for you. I know you didn’t want to hurt me the way you did. I have been in your shoes and I know it wasn’t a decision you came to lightly. I forgive you, if you care. All I ask is that you recognize that your experiences of me didn’t add up to the judgements I feel you made of me in the end. That wasn’t fair. All wasn’t as it seemed. I know it didn’t make any sense to you, how I acted, so I just ask you to trust that I had my reasons and my intentions were good. It was never about you, our ending was just “collateral damage” - a term that will speak to you and spark recognition – if there was ever any doubt. I’m sorry my friend. I let you down. Please forgive me? What is the point of this post? I don’t know. Just to let you know that I still love you, still think of you and miss you. That I replay things over in my mind and wonder if I could have… should have…. Done things differently. But I couldn’t. I too was in a terrible position. I didn’t know what my place was exactly, but I did know what wasn’t my place! Despite our deep connection, I knew there were things I could not say, and I knew you would NOT hear them. I was only trying to do the right thing and let you be happy. I hope you are. I’m sorry I couldn’t be a part of that happiness in the end. I’m sorry you felt you had to go. I’m sorry I didn’t ask you to stay. I wanted to, you see, but I knew you couldn’t, and I didn’t want to make it harder on you. I guess I just wanted you to know that. I’ll always hope to hear from you again one day, although I admit that is one conversation I cannot imagine. Thankyou for being in my life. I believe you were meant to come into it, and although it was short and sweet, I’ll always remember it fondly. (Like that lemon cheesecake icecream I had once many moons ago. Nothing will compare, although I will always keep searching!) Although you are no longer in my life, I still feel less alone knowing you are out there somewhere. Part of me will always seek to find you, or replace you in some way, however impossible that seems. I hope you think of me fondly too, despite it all. If not, at least do this? Please accept my apology and try to understand. I let you walk out of my life, but you’re always in my thoughts and in my heart. Everything feels so unfinished…. Because it is. Maybe this is too little, too late, but I hope we meet again. If not in this lifetime then in another. I will be ready, and I hope I will be better next time. Newer PostHow to avoid drama?